ASUS is one of the most active veterans in the market positioning itself as one of the leading brands. The company has abandoned the budget segment, focusing on Mid- and High-End notebooks. 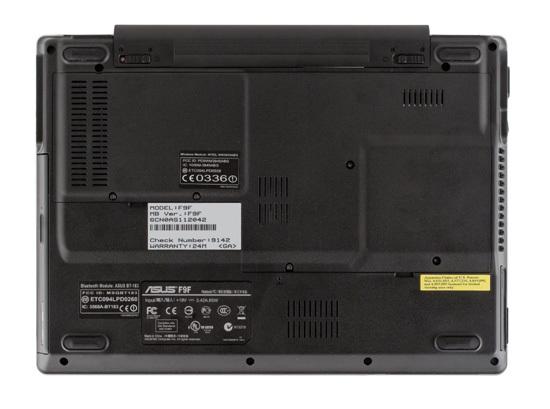 Our model under review is a light notebook equipped with a widescreen 12" display. Such machines are designed for use "on the go" and mostly have two requirements: small dimensions and low weight for ease of carrying it with you all the time. Since these notebooks are not meant to replace desktops and thus offer wide functionality and excellent ergonomics. Usually for tasks requiring features absent in these notebooks one just uses a desktop. But recently manufacturers have started improving functionality and ergonomics of ultra-portable machines, so they could be used for nearly all tasks. 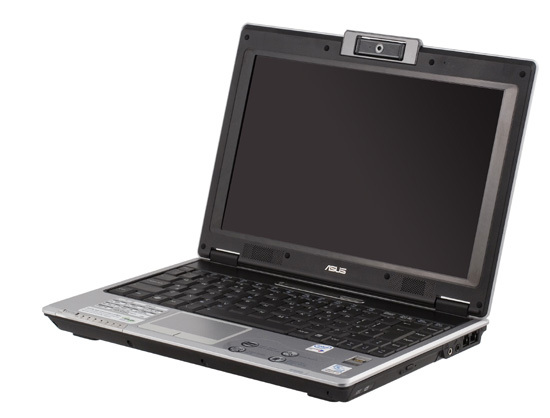 For example, our ASUS F9F has a built-in optical drive, which significantly expands its feature list. The description of the F9 series is published here. As we tested a sample, its bundle included only a PSU with adapters. We tested the notebook in reading mode (reading a book in a text reader) and in video playback mode (playing a DivX movie). Vista turned the notebook off at 4% charge. We ran the tests with both batteries - of half (23000 mWh ) and full (51183 mWh) capacity. We tested a sample, so the keyboard lacks russian labels. The keyboard layout is practically standard, only the Enter key is vertical. 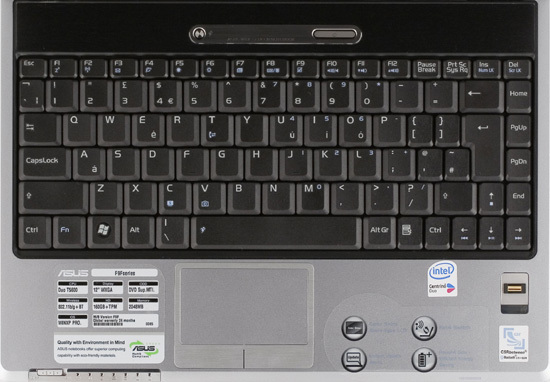 Just like in keyboards of larger notebooks, the pgup/pgdn keys are grouped into a vertical line to the right of the enter key, so the other keys had to be made narrower than usual. So two keys in the upper and medium alpha rows are narrower vertically than the others. The right shift key is also rather short. It's not opposite to the enter key, so you may miss it from time to time. The cursor keys are narrowed, so they are not very convenient either. What concerns positive moments, the ctrl key is located in the corner, so it's easier to switch from a desktop keyboard. The del key is also in a corner - it's easy to locate when necessary. The left part of the keyboard is fixed tight, but the right part is slack, especially in the upper part, so it's not pleasant to use the right part of the keyboard. The keyboard generally feels hard, but acceptable. 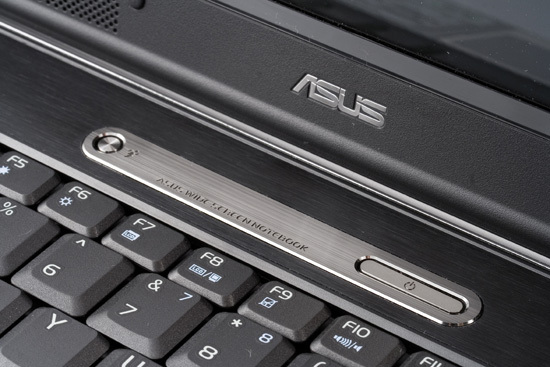 ASUS F9F has a rough metal-like touchpad, almost flush with the case. That's why you may accidentally "brush" its surface and move a mouse pointer - it's inconvenient, when you type. The touchpad is equipped with two standard buttons. On the whole, the rough surface makes it easy to use the touchpad. All indicators in the F9F are located in the left front corner of the keyboard panel. Your left wrist will block them, as you type. So you'll have to raise your left wrist to read the LEDs. If you don't raise your arm, you may guess that your hard drive is working by ear. The panel with indicators also houses the following elements (from left to right): wifi, Bluetooth, power, battery, HDD, numlock, scroll lock LEDs. All indicators are flush with the case. This model has only one additional button to run ASUS media center (it's based on Windows Vista features). It's hardly useful in an ultraportable model. The notebook also offers traditional controls for its functions (brightness, sound, monitor, etc) with Fn combinations. Besides, you can control a media player with them. On the whole, the case is made of good materials, except for the bottom lid - its plastic looks too cheap. The other materials look solid, especially the metal grid of the keyboard panel. What concerns the design, the model seems too heavy, especially for its class. 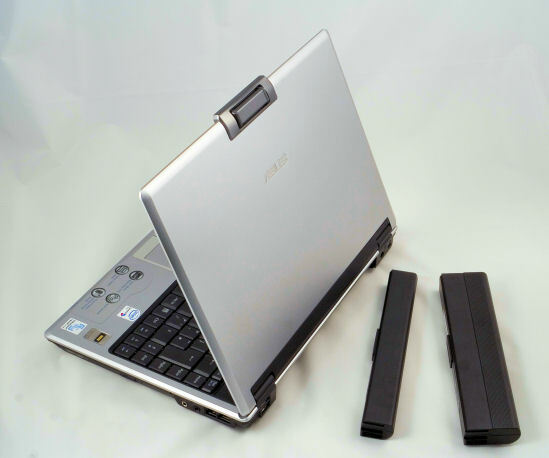 The web camera makes the lid visually heavier, metal frames of the keyboard panel suggest an idea that the notebook is heavy. The sides also make the notebook look heavy - a thin silver-like stripe stresses solidity of the black sides. I cannot help comparing the F9F with the Acer 3045, which has been tested simultaneously with the model from ASUS - it's smaller and lighter, of course (unlike the ASUS, it does not have a built-in optical drive), but it looks much more elegant. However, admirers of monumental designs will like this notebook from ASUS. The notebook is assembled well, there are no large gaps, creaks, bending panels. There is nothing on the front panel (its plastic part is slanted down), except for the above mentioned LEDs. So we'll skip the photo. The left flank houses the following elements (from left to right): a VGA port, a 7-pin S-video, a vent grid, an Express card slot, USB 2.0 and a card reader above it. Note the S-video connector, which is not always available in notebooks of this class - it's another multimedia bonus. The rear panel houses two USB 2.0 ports, a power connector and a Kensington lock hole. Owing to this layout, a power cord and peripheral cables (for example, a mouse) will not stick out of the notebook at the sides. The right flank houses a multiformat optical drive, audio connectors (headphones and microphone), as well as modem and LAN ports. The bottom of the notebook contains several vent grids. But I have an impression that the notebook works well even on a soft surface. At least it will have no problems with CPU overheating. On the whole, its ergonomics left a nice impression. 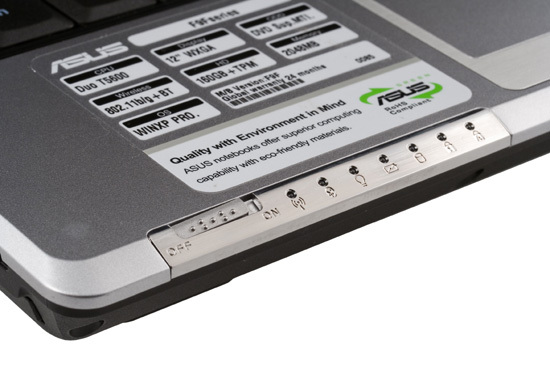 It's nice to have some USB 2.0 ports on the rear panel, so that cables are not lying at the sides. 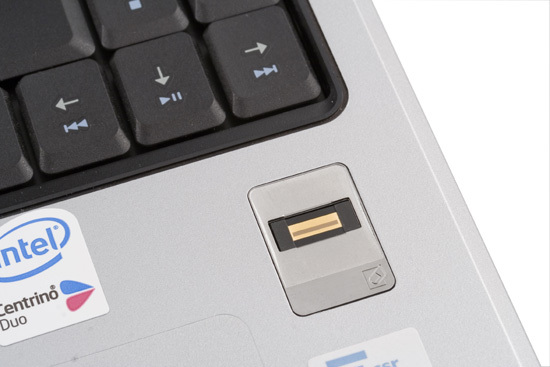 Besides, there is a USB port on the side, which can be used for a flash drive. Audio jacks are located at the side of the notebook, so the headphones cable will not lie in front of the notebook, and the plug will not stick there. The notebook is equipped with a typical panel for its class - mediocre viewing angles and other shortcomings of TN-film panels. However, these peculiarities are typical of all notebooks of this class. This display is fine for everyday work. However, it has some problems with movies and photos. You'd better use something else for them. Audio quality is also typical of the class. It will do for system events, but there are problems even with movie dialogues. We found out that the panel is too reflective - you can even shave in front of it. Intensity of reflections is horrible. You own reflection in dark movie scenes becomes a participant of the action (and the irritated grimace spoils the show ;) ). Subjectively, the notebook has a specific design, not all users will like it. In my opinion, it's too large for its class, and a tad crude. But my colleague liked it. 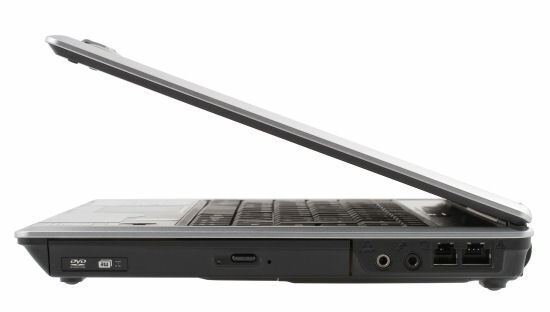 Interestingly, despite its smoothed edges, this ASUS notebook still produces an impression of "chopped forms". 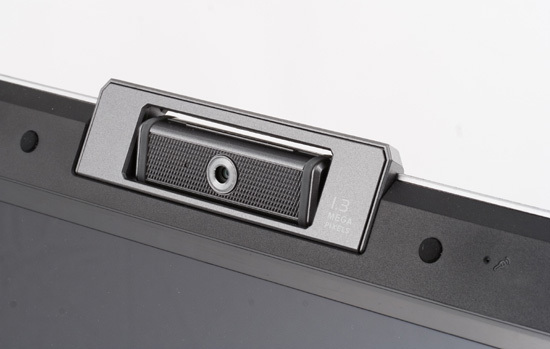 ASUS F9F offers a built-in web camera. It can swivel, so you can use the camera for conferencing as well as to monitor the surroundings when you are absent - there is a special program for that. The second useful bonus is a fingerprint scanner. It's a really useful device. On one hand, it raises security of the system (it makes passwords more complicated and less insecure to type - one cannot intercept it, overlook it, or steal it). On the other hand, it makes passwords more convenient - you don't have to remember multiple passwords, and so you are encouraged to raise security of the system. We should also mention that the notebook comes with two batteries of full and half capacities. It's an all-purpose model. On one hand, this notebook offers good dimensions and weight. So it's convenient in short trips and in business voyages. 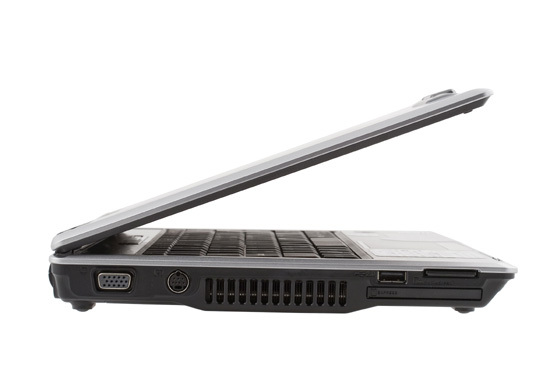 On the other hand, it offers good functionality, including an optical drive, and even some multimedia features. That's why it can be used for almost all work tasks on the go. Its web camera helps conduct video conferences when you travel. And a finger print scanner makes the notebook much more secure - an important feature for such a model. And finally, the notebook comes with two batteries, which gives you much autonomy. You have a choice, because you can take it on short trips (the smaller the better, battery life is not critical) as well as on long travels, when you can use a full battery or both. 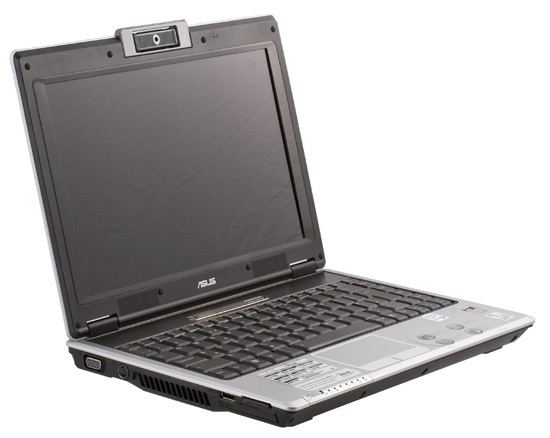 It's a typical ASUS notebook - quite large and heavy for its class, with a solid design, nonstandard materials, and some multimedia features. And most importantly, it's a more or less universal model with normal functionality, and it will not hamper you much. But I'm surprised at how much ASUS likes this horribly inconvenient keyboard layout. Besides, there are usually no problems with drivers.